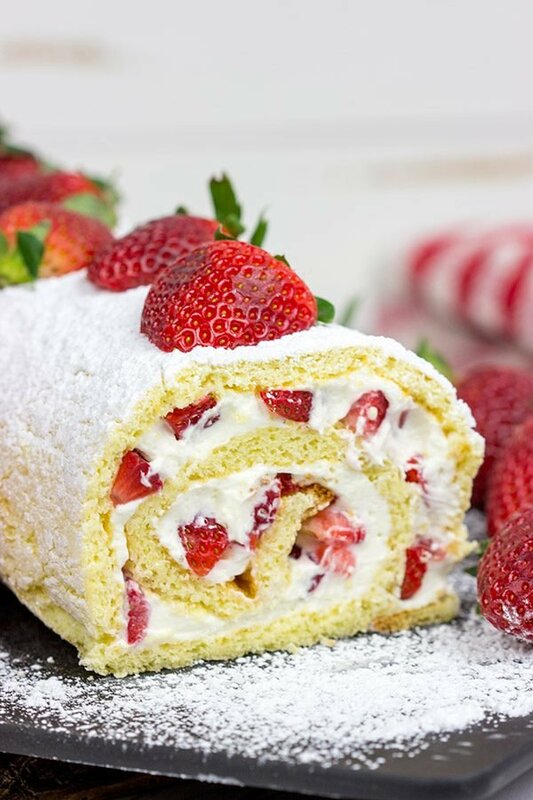 Fresh Strawberry Cake Roll - A fun way to celebrate fresh strawberries! 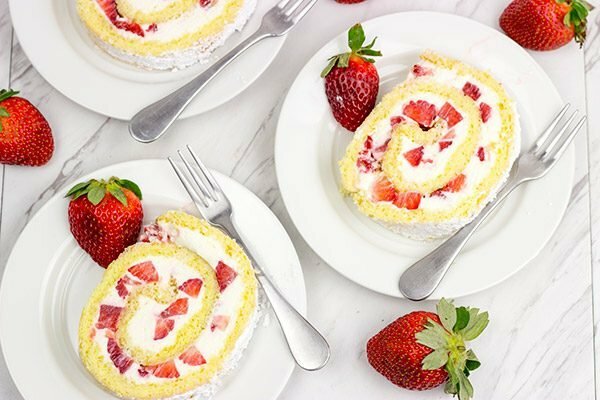 This Fresh Strawberry Cake Roll is a fun way to celebrate fresh summer strawberries! Grab a slice, sit back and enjoy! How do you do vacation? Do you prefer to grab 3 and 4 day weekends throughout the year? Or do you save up your days and then do one big vacation? We typically prefer to do the latter. I mean I love a good 3-day weekend getaway, but there’s just something so nice about packing it up and stepping away for an entire week. This year, Laura and I are heading to Italy (Venice and Florence) with my mom, and we are super excited! Laura and I visited Venice on our honeymoon, so we’re looking forward to getting back there again. We’re looking forward to salami piccante pizzas. And we’re also looking forward to drinking wine out of 1.5-liter plastic water bottles. Seriously. When you go to a wine store, do you often just wander the aisles confused about which bottle to get? We do. That’s not the case in Venice. The reason? Vino sfuso. So what is vino sfuso? Translated as “loose wine” or “bulk wine,” it’s literally just that. Wine that is sold out of large barrels (think beer taps…but for wine). Vino sfuso shops are often small and sometimes a bit hard to find (they’re not geared towards tourists), but they’re worth tracking down. And here’s the thing. These shops sell empty jugs, but it’s just as acceptable to bring in your empty 1.5-liter water bottle. Fill it up, pay about €2-€3 (currently ~$3-4) and you’re on your way again. Is the wine actually good, you ask? Well, it’s certainly not bad. It is most definitely table wine, but even (most) Italian table wine is good. I feel like vino sfuso shops are one of those best-kept secrets in Italy. We heard about them thanks to Laura’s ex-boyfriend, so we tracked down a shop. It took a bit of hunting, but we found one. It was a small and simple place. There were about 8 barrels of wine, each with a tap at the bottom. We filled our own jugs, paid the shopowner (who spoke no English at all) and off we went with jugs of wine in our backpacks. Win! Laura and I were sitting around the other night chatting about Italy while we enjoyed a slice of this Fresh Strawberry Cake Roll. (And for the record, we certainly had a glass of wine with our cake…even if it wasn’t wine from an empty water jug!) One of my all-time favorite cakes is this Fresh Strawberry Cake, and I decided to put a different spin on it this year. Instead of a traditional cake, I wanted to roll this one up as a cake roll. A Fresh Strawberry Cake Roll filled with a whipped cream-cream cheese frosting. This dessert is perfect for spring and summer when fresh berries are plentiful! 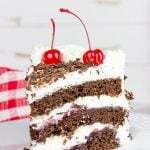 Have you ever made a cake roll? They’re fun! You start with a thin cake that bakes in all of about 10 minutes. And then while that cake is still hot from the oven, you roll it up using a kitchen towel. Let it cool, and then you’ll be able to unroll that cake and fill it with frosting and berries before rolling it back up. It works! 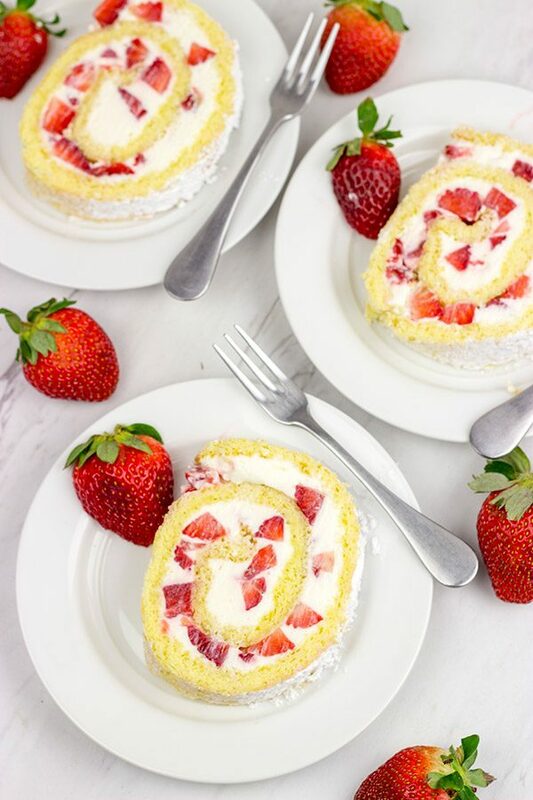 This Fresh Strawberry Cake Roll is definitely a new way to enjoy an old favorite in our house. So grab a slice of cake, sit back and plan your next vacation…one that may or may not involve wine in empty water jugs. Cheers, friends! 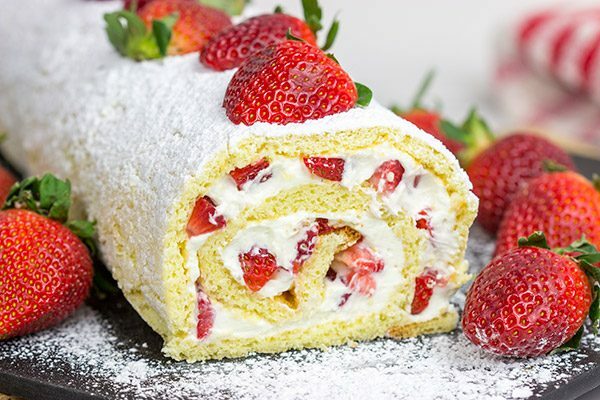 Did you make this Fresh Strawberry Cake Roll at home? Leave a comment. Or snap a photo and tag me on Instagram (@Spicedblog)! Line a standard 11”x17” jelly-roll pan (rimmed baking sheet) with parchment paper; spray paper generously with nonstick baking spray. Set pan aside. Using an electric mixer, beat the eggs and vanilla together on high speed for 4-5 minutes, or until mixture turns foamy and lemon yellow in color. Add sugar to the bowl in (3) separate ¼-cup additions, mixing for 1 full minute after each addition. Add oil and mix until well combined. In a separate bowl, combine flour, baking powder and salt. Fold flour mixture into the egg mixture until just combined. Pour batter into prepared baking pan. (Tip: Spread batter evenly to edges using an offset spatula.) Tap pan on counter several times to remove air bubbles. 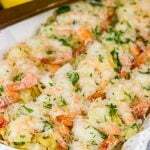 Bake for 10-12 minutes, or until lightly browned on top. While cake is baking, lay a large, thin kitchen cloth on counter. Sprinkle powdered sugar generously on top of cloth. Once baked, immediately turn hot cake out onto the powdered sugar-dusted cloth. Remove and discard parchment paper. Starting with a short end of the cake, roll up cake (and cloth). Let rolled cake cool completely (1-2 hours) before continuing. Dice ¾ of the strawberries; set aside. Using an electric mixer, beat together cream cheese, butter and sugar until smooth (~3-4 minutes on medium-high speed). Add vanilla extract and whipping cream; beat on high until stiff peaks form. Carefully unroll cake and spread frosting evenly on top of cake. (Tip: Make sure to frost all the way to the edges.) 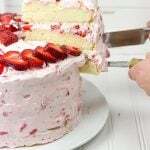 Sprinkle diced strawberries on top of frosting. Roll cake back up (this time without the towel). Wrap cake roll in plastic wrap and refrigerate for at least 1 hour. Slice remaining berries and place on top of cake roll. One of the things I miss most about living in Italy is the free availability of really really cheap but perfectly drinkable wine. We used to live close to vineyards where you could go with your own bottles or jugs. They fill them up with their vino—a frizzy white like most Roman wines—at an amazingly low price, literally a euro or two per liter. Talk about sticker shock when we moved back to the States… ! Yes! I was reading about your background on your site the other day, Frank…and I was totally jealous that you lives near vineyards. Yeah, sticker shock doesn’t even begin to describe wine prices in the States! If you paid a Euro for a bottle of wine over here, you wouldn’t even be able to drink it. Haha! And I totally understand about shedding some winter pounds…we’re in that mode right now, too. That’s why I just cut small slices of this cake for us! 🙂 And then I sent the rest in to Laura’s coworkers. I’d be in real trouble if her coworkers weren’t there to help us with desserts! Thanks so much, my friend! This recipe is definitely for my daughter. My hubby would always buy cake roll for her from the supermarket. But I always try to stop her from eating those cake because of added preservatives in it. Yes! Cake rolls are always fun, and they look really pretty, too…and you can totally make them at home. I was a little skeptical at first, but it works! And you can just put whatever twist you’d like to put in there as far as flavors. Since we’re heading into strawberry season, I went with fresh strawberries…but there are tons of other ideas here, too. Thanks so much, Puja! Have so much fun on your trip! I love Venice! Have you read The City of Falling Angels? It’s hard to describe exactly what the book is about, other than saying it’s about Venetians, but it’s so good. I might have to reread it soon, most likely while I’m eating a slice of your strawberry cake roll. You’re sending some out here right? 🙂 Have a great weekend! So no, I haven’t heard about The City of Falling Angels. I definitely need to check that out. We have a long plane trip ahead of us, so that sounds like the perfect time to read…that is until I get exhausted and just sit there in a comatose state because I can’t actually sleep on the plane. But it’s worth it to go to Italy! 🙂 And, yes, I have some of this strawberry cake roll all packed up and heading your way, Kelsie. It should arrive soon! CLOSE THE FRONT DOOR! You’re going to Italy this year! I’m so fun jealous! I love week long vacations but we hardly take them anymore. We live across the country from our family, and everyone in MY family is divorced and remarried, we have to break up our vacation time to visit everyone. By the time we book flights for the holidays and what not, our 2-week vacation window is drastically cut short. That results in Kieran and I taking long weekend vacations instead. However, I’m happy to report we’re finally taking a week-long vacation this summer to camp in Denver. Holy smokes, I just wrote you a dang novel. Before I go I at least want to say this recipe looks amazing. Seriously! I totally hear ya about vacations. Going out of town to visit family is fun, but it is not a vacation. Not even close. So needless to say, we’re super excited to go to Italy this year. I know we’ll miss Robbie like you wouldn’t believe, but hopefully we’ll be able to start taking him on vacation with us in the next couple of years. Speaking of vacations, you and Kieran are going to camp in Denver? Uh, awesome! Is this some sort of adult summer camp?? I need to learn more! Hello David ! You bring the memories of my childhood back: my grandparents had a big wine yard and when autumn arrived we had to pick the grapes and sort for vine making….. those happenings have regularly turned into fiesta and lasted for two days. We had such a fun 🙂 And, yes, my grandmother was selling it really at low prices; I still remember “contadini” dipping the slices of bread into red wine to have for breakfast ……. Wow…your grandparents had a vineyard!? That is so awesome! I think that might have to go on my wishlist for when I’m older now. 🙂 (By older, I mean retired as I can’t imagine finding the time now to actually harvest grapes and make wine!) Thank you so much for the kind wishes, my friend. We can’t wait to head over to Italy, too. And maybe I’ll have to try your idea of dipping bread into red wine for breakfast! Half the fun of taking a vacation is the planning and anticipation! Of course, then there’s the vacation! It sounds like you have a great one planned. Your cake roll is absolutely perfect! It makes me hungry just looking at it! Oh, I totally agree with you about vacation, Kathy! In fact, I plan to spend some time later this week just researching restaurants and fun things to do in Venice and Florence. Then I’ll totally come back (probably armed with new recipes) and remake foods that reminded us of that trip. It’s a way to stretch vacation memories out! 🙂 Also, thanks for the kind words about the cake roll, too! Finding the n’non-touristy’ parts of places on vacations is what I really try to figure out when we go on vacation (for the record week long > 4 day weekends). There’s something special about getting the genuine experience of living there that something like those Vino sfuso shops would be. It can be a challenge to figure out but soooo worth it. And for the record I also agree about rolling/unrolling cake rolls. I was so nervous the thing was going to completely fall apart on me…but it didn’t. Nice and easy! Thanks so much, Matt! I’ve been trying to make a cake roll for years, but it never works. I suspect I’m not dropping it onto a steep enough incline. Also, I’ve found that a soft frosting almost guarantees that it will not roll very far at all. Yes, you definitely should try a harder frosting for your cake rolls, Jeff. Or if nothing else, lots of sprinkles coating that softer frosting. Also, I heard wheels work really well when rolling things. Maybe add some Oreos to the mix? I guess there’s a case for both a long weekend and an entire week or more! Either is nice 😉 So excited for you guys to go to Italy again! You must be really looking forward to it! Hubby and I want to go one day too….I can only imagine the food! That’s usually what I think about when travelling, lol. I’ve never made a roll cake before, but you make it look easy! 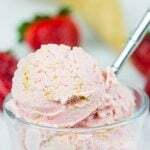 This one is perfect and love the pieces of strawberry in there. I guess cause there’s fruit, this is totally acceptable for breakfast 😉 ?? Usually, my vacations are just long weekend getaways. Sounds like a great vacation. The strawberry cake roll looks yummy! Hey, I love a good long weekend getaway, too! In fact, Laura and I were just talking about planning one (or two?) weekend getaways later this summer to Vermont and maybe Montreal. We shall see! Also, this cake roll is really, really delicious! Thanks, Dawn! I love both actually…small vacations are fun and so are the longer ones! I am going to Paris and Zurich in June..my first time actually to Europe and I am so looking forward to it! 🙂 The cake roll looks so good David, perfect for summer! Enjoy your trip to Italy, how fun! I totally agree that small vacations are just as fun as big ones…I mean they’re both vacations after all! 🙂 I’ve actually never been to either Paris or Zurich, but I’d love to visit both. In fact, we almost went to Zurich this year, but ended up in Italy (surprised? I’m not). Haha! I hope you take lots of photos to share with us later! Thanks, Manali! Oh neat, I haven’t heard of this bulk wine jug selling that you speak about… That would have been useful to know when I studied abroad in Italy at 20 years old! 😉 I’m jealous that you are headed to Italy this year… my favorite place in the entire world! Venice is such a dream, isn’t it? I haven’t been to Florence yet. Next on my Italy city list is Naples (I have ancestors from there… plus, ya know, for the pizza) and the Amalfi Coast! So I’m kinda thinking it was a good thing we didn’t know about this bulk wine back when we were 20-year olds studying in Italy. (I was in Rome…I’m not sure vino sfuso is a thing in Rome?) Italy is totally our favorite place in the whole world, too, and I’m sure we’ll be back many more times. I haven’t been to Florence since I was in high school, so I’m excited to explore that city! The Amalfi Coast (and Capri!) is such an amazing area…we wanted to try to get to Capri on this trip, but it’s just a little too far away to make it work. I’m ok with Venice and Florence, though! 🙂 Thanks, Nicole! Love “jelly roll” cakes. We use to have them growing up and I’ve been saying for years I need to make one, bought the pan about 6 years ago – still not cake 😉 – now I have a good recipe – thank you !!! Vacations were always to visit family, now that our parents are gone, we no longer do a week in NY and a week in Fla.
NY 4-1/2 yrs ago to visit friends and S-brother and sil – had a great time, autumn in NY is awesome, had been 28 years since we had been up in autumn. 4 years ago we took 2 weeks and went west, first real vacation in years, I stayed a week Idaho with my BFF from HS and D went up to Calgary to see his Uncle, then his brother met up with them at the border for a night and he came back to Idaho for 2 nights, we drove through Yellowstone and Tetons on our way back home, only had 2 days to do that, plan to go back when we have more time. We plan to head to Colorado to see his brother and family then up to Idaho to my BF and then hopefully through the parks and a stop in MI to see another friend and his aunt & uncle on way back to TN. He retires end of year or next year and that will be our “retirement trip” One big Hurrah before settling down to everyday retirement and figuring out what we are going to do. We have done some long w/e’s a few times, but I prefer at least a week, seems more like vacation with a week or two. Have never been to Europe – sounds like an amazing vacation – hope you had a wonderful time ! Hey Mar! Well I say that pan needs to come out and get broken in soon…maybe this weekend? Better late than never, right? 🙂 Your vacation plans from out west sound like a great time. I’ve visited a couple of states out in the western US, but pretty much only for work…so I didn’t get a chance to travel and “vacation” much. The thing about living on the east coast is that it’s almost a shorter flight to Europe than it is to California. Crazy! You really should put Europe on the bucket list for one day in the future. It’s an amazing spot, and I’m happy to share details of where we’ve been if you want to start planning! Thanks again, and I’ll definitely start brainstorming some post ideas drawing on our recent trip to Italy. Stay tuned on that front! Happy long weekend!! We’ve been out west 3 times, twice to see his brother and the trip 4 years ago. Some very pretty country, though we pretty much were in one spot on our trips. Enjoy the long weekend !!! Hey Mar! Southern England is also on my bucket list. I love the English countryside…it’s just so peaceful and idyllic. 🙂 I totally understand about waiting until neighbors are back in town before pulling out the jelly roll pan. Or maybe you’ll just need to host a summer party! Either way, I hope you had a great long weekend. We enjoyed the time off, and we got our garden planted and yardwork done. DUUUUUUDE – Y’all are going to Italy!!! Yayyyyy!!! Venice and Florence are on our list for next year so I cannot wait to read about your trip when y’all get back! And – next time we are there, we are going to have to look for those vino sfuso shops. Last year when we went we were all about the Limoncello though – Limoncello on it’s own, Limoncello crema, Limoncello with fro yo! Oooh! 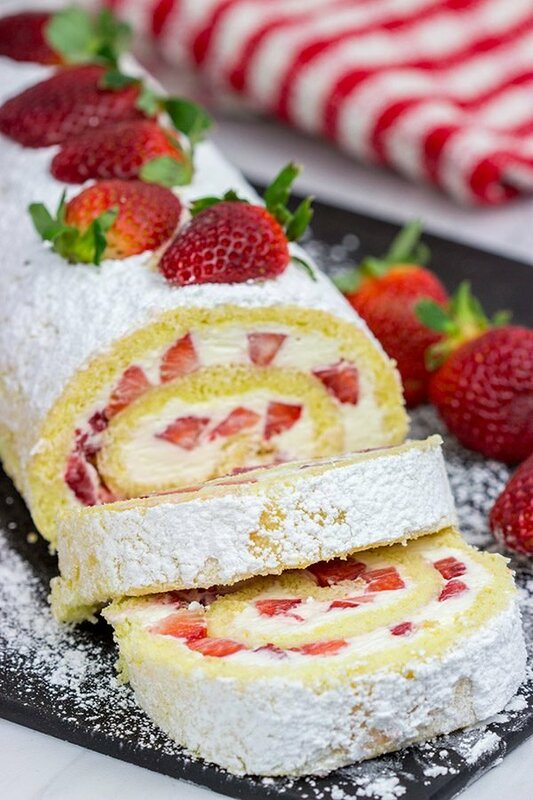 And speaking of booze – yes, booze + desserts are wonderful together – especially when said dessert is a delicious strawberry cake roll! It’s been too long since I made a cake roll and that needs to change – gosh, I’m wishing I had a slice of this for breakfast! 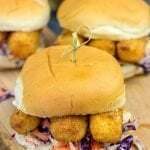 Remind me NOT to stop by your page on an empty stomach! So we actually just got back from Italy, Shashi! And, yes, I’m already ready to go back. We had an amazing time. I’ll get around to writing about it here on the blog sometime soon, but the food. Oh man, the food. And the wine. And we went truffle hunting, too! Like for real truffle hunting. Just me, Laura, 2 guys and 2 dogs. 🙂 In the meantime, though, let’s make a strawberry cake roll and share stories of our Italian travels, ok? Vino Sfuso shops sound amazing – thanks for sharing this secret with us. I have been to Italy so many times but never came across one of those! 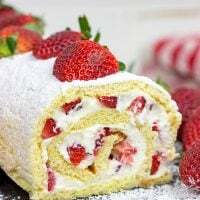 Need to track one down next time we are there 🙂 My mum made strawberry cake rolls when we were little, loved them so much but never thought of making them myself. Might make this one for our next garden party – looks delicious! So I believe those vino sfuso shops are only found in the Venice area, Miriam. We actually just got back from Italy, and believe it or not we didn’t make it to any vino sfuso shops. The wine (even table wine) at our meals was so good that we didn’t want any more! Although I was kinda tempted to find a store just because it’s fun to fill a 1L water bottle with wine. Haha! As far as strawberry cake rolls, you should totally do it! I was a little worried about the whole rolling aspect of this one, but it wasn’t that hard. This would be perfect for a garden party! Thanks so much, my friend! Your cake is pretty as a picture and your pictures are pretty. The cake has to be delicious. Haha! Hey, I don’t blame ya one bit for going with the pie. I mean that’s like picking between awesome and more awesome. 🙂 Hope you enjoy that pie (if there are any leftovers), and have a great weekend, my friend! Next on list after pumpkin pie is blueberry pie for D and a buddy of his – do you have a recipe for one ???? Wow, you have been baking up a storm this past week, Mar! But I bet your kitchen has never been happier. 🙂 Blueberry muffins are one of my all-time favorites! As far as pie, I don’t have a classic blueberry pie recipe, but I do have a fun blueberry tart that’s getting posted on Monday actually. It’s similar to a lemon curd tart, but you just use blueberries instead. It’s a fun one, but it’s not a classic blueberry pie. I’ll have to put that on the list, though! I bet I have a recipe hanging out here somewhere in one of my Mom’s notebooks. Haha! friends coming tomorrow – strawberries didn’t look good so made mini raspberry tarts, mini blueberry tarts, brownies, pumpkin pie and lemon mousse cheesecake for dessert. Macaroni salad and coleslaw are done, have homemade applesauce. D is responsible for roasting the chicken !! Wow, you really are baking up a storm, Mar! You need to start a blog so you can share all of these delicious ideas. 🙂 We had a picnic with friends this past weekend, and we made macaroni salad as well as my mom’s 3-bean salad (in addition to hamburgers, of course). We made double batches of both to (1) make sure we’d have enough food but really (2) make sure we’d have leftovers for us. And it worked! Also, I share Bob and Liz’s love for a good blueberry muffin! I’ve though about blogging, my problem is I’m not online every day, not sure I could keep up with it. 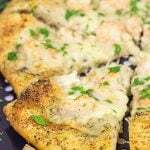 I do have a small, closed, recipe group on FB where friends and I share recipes and I occasionally put them on my FB page. Off to find your blueberry tart recipe from Monday – Hope you Laura and the little one have a great weekend !!!! You are totally right that desserts often taste better the next day…and the ease of preparation certainly helps, too. I’m like you when it comes to baking desserts. I have to save a couple of slices and then share the rest with friends…otherwise, I’ll eat it all! Every once in a while we’ll save a dessert by freezing it, but most of the time it goes to the curling club or to Laura’s work. I hear ya about being online all the time with blogging. It definitely was a change of pace when I started, and sometimes I really just want to disconnect and walk away…I try to do that as much as possible on the weekends, though. Either way, hope you had a great weekend, my friend! It’s been hot (HOT!) up here lately. Hot here too, though I think you guys beat us the other day by a few degrees, it’s those darn “feel like” temps that are a killer!! 105 is crazy ! Happy (belated) 4th to you, too, Mar! I hope you had fun at Bob and Liz’s cookout! 🙂 I’m down in Maryland right now at Laura’s family summer reunion, and the weather is wonderful. (That never happens in mid-July in Maryland! Hah!) Cheers, my friend!